1. Add spinach, berries, radishes, and shallots to a bowl. Toss lightly. 2. Pound chicken breasts to an even thickness. Grill chicken breasts over medium high fire for 3-5 minutes on each side or until a thermometer reaches 160˚F. Remove chicken and allow to rest for 10 minutes before slicing. 3. Add mustard, vinegar, honey, parsley, salt, and pepper to a bowl. Mix well. Slowly drizzle in olive oil while whisking. 4. Pour dressing over salad and toss gently. 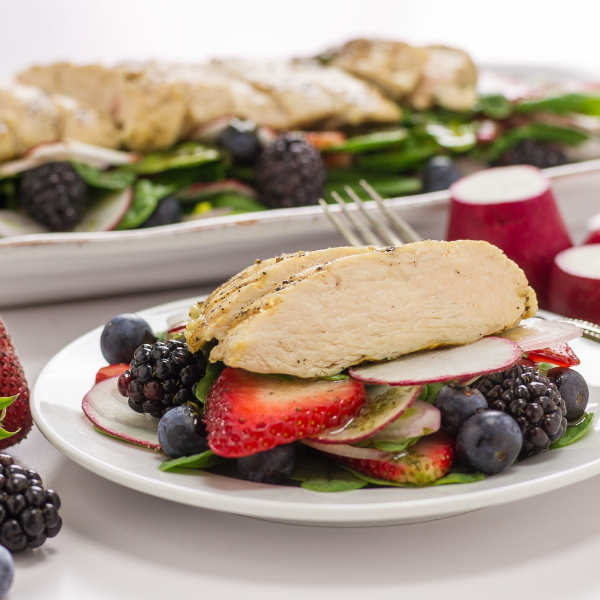 Plate salad and top with pieces of grilled chicken breast. Serve immediately.